Pop-ups are a great way to focus a visitor’s attention on opting in to your list. You can link pop-ups to buttons, images, or text on your page. When a visitor clicks on the object you have linked to the pop-up, your opt-in form will appear. To create a pop-up, follow the steps below. On-page pop-ups are separate from the standalone pop-ups listed on your account dashboard. For more information on standalone pop-ups to place on your blog or website, click here. Any pop-ups created within a page or site are specific to that page or site and only available within the page or site. Most Leadpage templates come pre-loaded with on-page pop-ups ready for you to edit. You can of course delete these template pop-ups as well and create a new one from scratch. Hover over your button, then click Edit Pop-Up as seen below (alternatively, click your button, then click the link icon in the widget settings panel). Drag any linkable widget to your page (such as a button, image, or text)—or, use an existing widget on your template. We’ll be using a button widget in this guide. Hover over your button, then click Add Click Event > Open a Pop-Up > Create New Pop-Up. To edit your form, click on any part of the form widget and edit its options in the left-hand sidebar, as shown below. You can learn more about editing your forms here: The Form Widget. 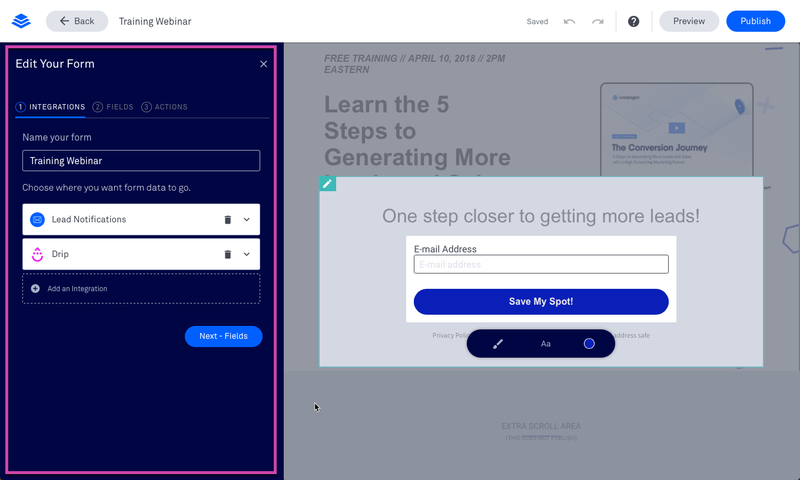 Forms are one-step opt-ins, the form appears embedded on the page. Pop-ups are considered two-step opt-ins; the form only appears after a visitor clicks a linked object like a button, text, or image. 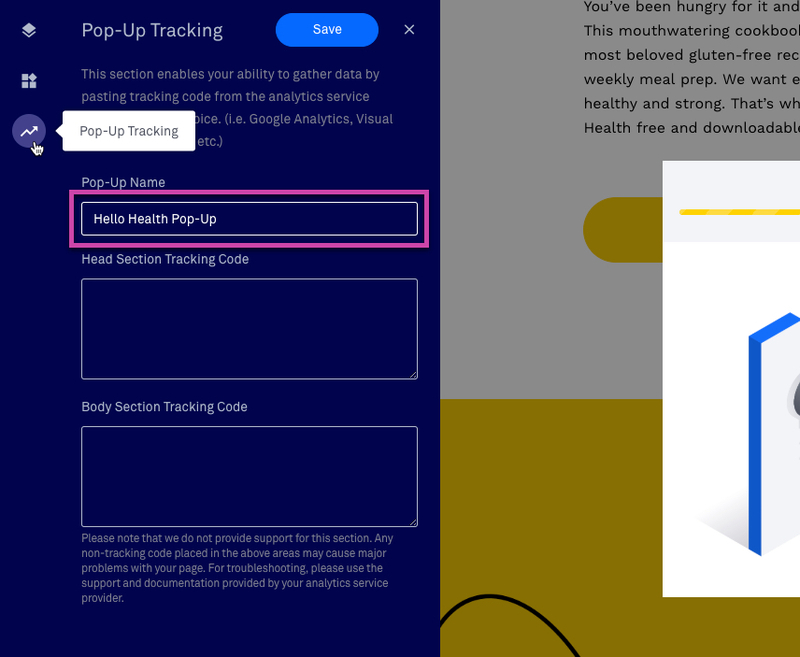 We recommend naming your pop-up to make sure it’s easy to keep track of (especially if you set up multiple pop-ups on the same page). To name your pop-up, click Pop-Up Tracking in the left-hand sidebar, then edit the name field and click Save. Note, if you've got your form settings open, click anywhere outside of the form widget on your pop-up to access the Pop-Up Tracking option. When you’re all set, you can test your pop-up by previewing your page—it will pop up when you click its trigger.